Reversible Jewelry: 5 Sapphire Starry Sky Pendant (Sterling Silver) in a Wood Box - New! 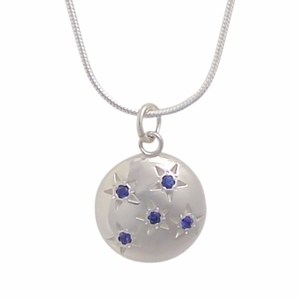 This original pendant has five deep blue sapphires set into a sterling silver universe. On the other side of this pendant is a melting heart design... the relief of heart within the flat surface. This unique jewelry can be worn either way. It's a reversible pendant with two totally different designs. The size is 5/8" in diameter, and it comes with a silver chain. This necklace is packed in a wood box, for a lovely presentation. This design is suitable for any occasion. For special significance, you might consider it for a 5th Anniversary gift. Sapphire is also the birthstone for September, so it could be a lovely birthday gift, as well.